Alan Albrecht, Milagro, #751 has the Euro version Yanmar (3GM30FYEU) and writes: Johnson Pump, USA does not sell a rebuild kit for our pump version F4B-903. Here are the correct impeller numbers (both Johnson and Yanmar) for this model as well as the individual part numbers required for a rebuild of the pump. 8. Glycerin, Vaseline or lube to lubricate the inside of the pump until it refills with water. Some years ago I also over tightened 2 of the screws holding the pump top and broke off the raised bosses. I didn't replace the body assembly but used a 1/8 inch drill and drilled thru the pump top and body top flange. I then inserted 1/8 inch bolts long enough to assemble with a lock nut on the underside----it works fine. Underneath each of those raised bosses there is a cavity which I think was probably formed when the bosses were pushed upwards during manufacture--the lock nut sits neatly in the cavity. I think they should have been made that way originally not using the self tapping screws originally supplied. After 3 years sailing Silver Lining, including some extended trips, I finally got around to installing something we’ve always wanted – a holding tank monitor. Normally, I would have not considered an internal, float-style system, but the WEMA kit received high marks on a recent Practical Sailor magazine test. So went it went on sale this summer, I figured the time (and price) was right. I purchased the gauge (HTG-WW) and 12” sending unit (SHS-12) online (www.wemausa.com) for about $83. WEMA recommends that the sensor be sized so that its bottom is no lower than the ¼ full point of your tank. This is to keep it out of the “sludge” and minimize the chance of fouling. Although the sensor can fairly easily be removed for cleaning, I chose to locate it as close to the tank vent fitting as possible. The reason being is that I usually introduce fresh water to the holding tank via the vent line while pumping out. I believe that helps to flush out any solids. Positioning the sensor close to that fresh water spray may help to keep it clean also. Several excellent how –to articles have been written in Mainsheet on installing washdown pumps in larger Catalina models and due to time constraints I am going to limit this one to a few notes based on my installation and about four year’s use of our upgrade. I decided to install PEX tubing instead of hose for the hidden run from the pump to the hose bib. It is much easier to run through the hard to reach areas behind the seats as it is self snaking. It is very freeze resistant and it eliminates the need for clamps by using compression fittings. This has proven to be an excellent, no-maintenance choice. I only needed to drill one hole to run it from under the head sink to the anchor well and that was through the v-berth bulkhead. I installed a few plastic pipe support clamps under the seats to prevent the tubing from sagging and holding water in the low spots when it needs draining. I hope this will help you decide on how and where to mount a TV. I bought my bracket and TV at Best Buy in San Diego. 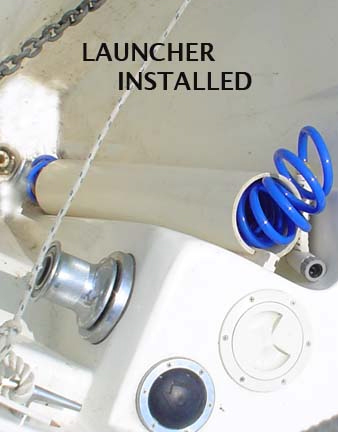 I use a small inside TV antenna with a power booster while on the hook or mooring at Catalina. At the dock at Coronado Yacht Club we have cable TV. I have a small inverter that powers it and the DVD player. Geoff Stevenson, a former C320 owner who now owns a C350, called me after reading the May Mainsheet to point out another possible reason for a hot-running engine. He reminded me of the “recall” on certain Yanmar 3YM engines to correct an inadequately engineered cooling tube array. His experience (on both boats) was an inability to reach max power settings and chronic overheating. These early (2004/2005) engines have a 38-tube heat exchanger, and some very early engines were reportedly also fitted with a smaller capacity raw water pump than is now used. The fix is to replace the original 38-tube heat exchanger core with a new 63-tube one, and change the water pump if necessary. If you have a 3YM engine exhibiting similar problems, you may want to check with Yanmar to see if your engine is covered under their (silent) recall, especially if you have an engine serial number under 6,000. Prior to our extended Chesapeake cruise last year, I installed an anchor Washdown largely based on the experiences and recommendations of Allan Field, Sea Shadow, #808. His project can be seen at http://tinyurl.com/mqxxjh. At the time, I removed the hose to the marine head and connected the thruhull to the suction side of the washdown pump, since we avoid using saltwater to flush. Since that time, I have plumbed the washdown into the sink outlet using a “Y” connector. 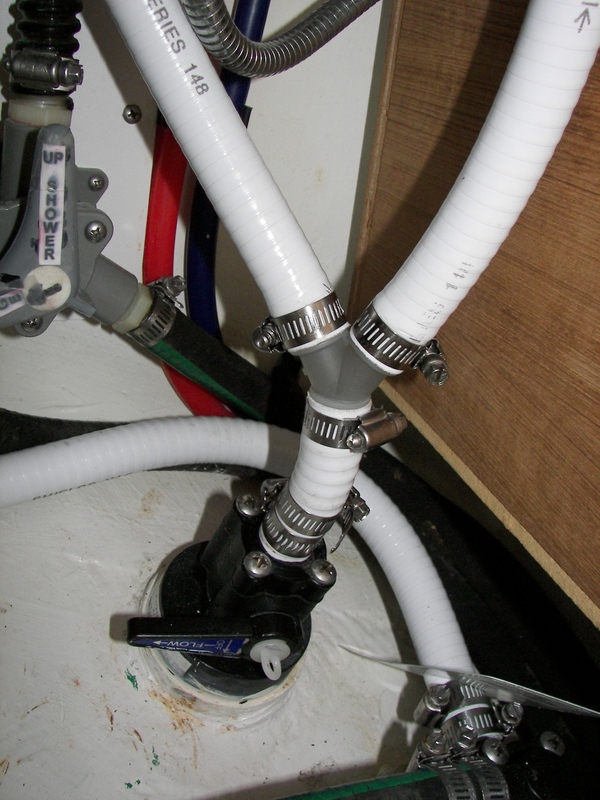 This also allows the ability to easily flush the washdown hose by introducing fresh water through the sink. Winterization is also easily accomplished by using the sink to introduce antifreeze to the system. BTW, I would have liked to double clamp on the “Y” however the length of the fitting did not allow for sufficient area for a second clamp. Fortunately, it was an extremely tight fit for the hose and I doubt it would slip off even without a clamp! This spring, we replaced our factory 12 gal.tank with a 22 gal. Ronco B348 tank, the same model now used by the factory on newer C320’s. Why do this? We are cruisers. We like to anchor or moor rather than take a slip. We hate having to pump-out every three days. I use the rule of thumb of 3-4 gal. per day for the two of us. With the new tank, I figure we’ll get at least 6 days between pump-outs. The original tank was shorter but wider and not nearly as long. It sat on a wood shelf the legs of which were glassed to the hull. The new tank is much longer, taller, but narrower, and needs to sit on the hull so the shelf had to come out. Removing that shelf was the worst part of the job. The advice received from the C320IA discussion list, including pictures from two owners, was invaluable in giving me the confidence to proceed with the project. Just knowing the job is doable makes it easier to undertake. Having the practical advice makes it worthwhile. I bought the tank, hose, and fittings from Catalina in Florida. Ellie Quinn in Parts was a big help. She knows her stuff and got the parts to me quickly. By the way, the prices were as good or better as I could find elsewhere. You can pay $8-$10 a foot for better hose; but, I didn’t bother. The production stuff is good enough for my needs. 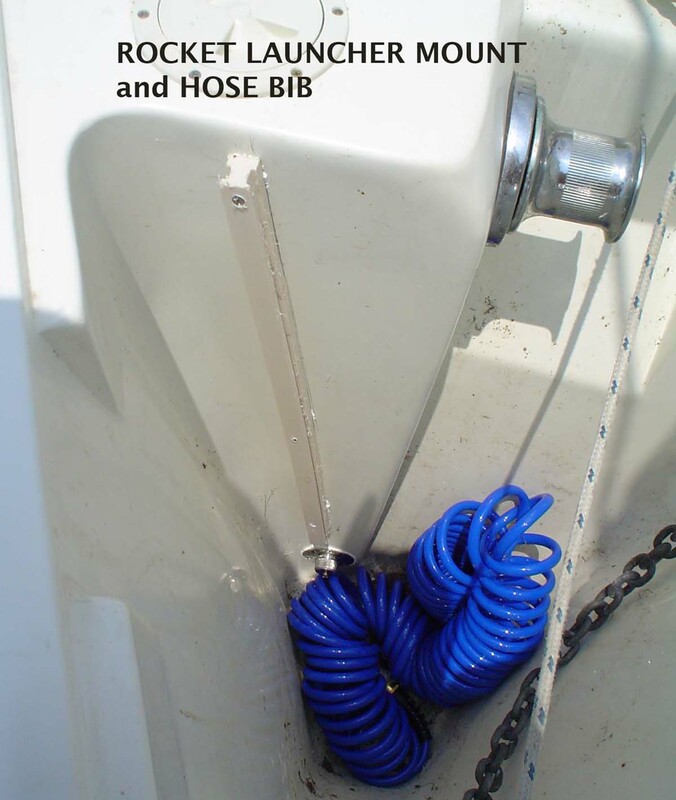 Frustrated by the bilge partially refilling after the pump stops? Adding a check valve on the pressure side of the pump can help reduce the “backwash”. See the photo. 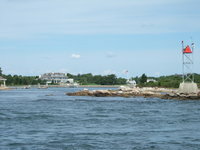 (Many boaters believe that check valves are not favored in bilge pump systems. They reduce flow, are notorious for failing and the added obstruction increases the chance of a stoppage. If you install one, inspect it frequently. – Ed. 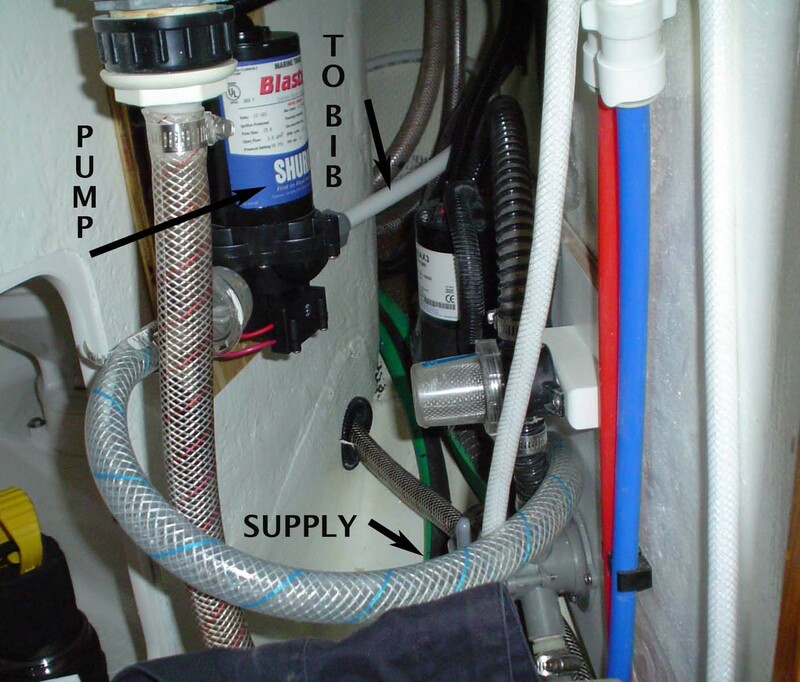 Note) Another alternative is to replace the OEM pump with an 'automatic' pump (Rule has one) that has no float switch and mounts directly in the bilge (minimizing backwash by eliminating the bilge to pump hose run). They work by performing 'check runs' every few minutes; if the impeller senses resistance (water) the pump continues to run and pump out the bilge. No impeller resistance means no water, so the pump shuts off within a couple seconds. The Rule pump I bought and refer to is rated at 500 gph, draws 1.9 Amps, and is much quieter than the OEM pump.